Good Georgia Civil Rights Lawyer Mario Williams obtained $350,000 for Terrance Dean, a prisoner at Macon State Prison who had been beaten by correctional officers. Mr. Williams, who specializes in wrongful death police misconduct cases filed suit against correctional officers many of whom have been recently indicted for their crimes by the Department of Justice after a GBI and FBI investigation. Several news organizations have featured the story involving this prison abuse incident. Mr. Williams has an extensive understanding of police misconduct and Section 1983 matters throughout Georgia and thus is able to effectively advocate justice for his clients. 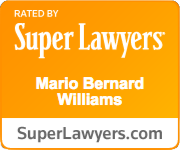 Additionally, Mr. Williams is a graduate of the FBI Citizens Academy.For more information on Mario Williams read here. Williams Oinonen LLC handles wrongful death police misconduct matters throughout the state of Georgia. For more information, call 404-654-0288.